Please visit www.china-economy-policy.com to order reports and learn more about subscription offers. China’s Economy and Policy (CEP) is closely affiliated with Chinese government institutions and authoritative research agencies which enables us to give clients the most up-to-date and accurate intelligence about economic developments as well as policy predictions. Based on proprietary knowledge, China’s Economy and Policy (CEP) delivers reliable economic and policy expertise on over 15 strategic sectors (listed below) in the Chinese market as well as their impact around the globe. The Chinese Academy of Social Science (CASS, 中国社会科学院) is the “think-tank” for the Chinese government and strategic corporations. 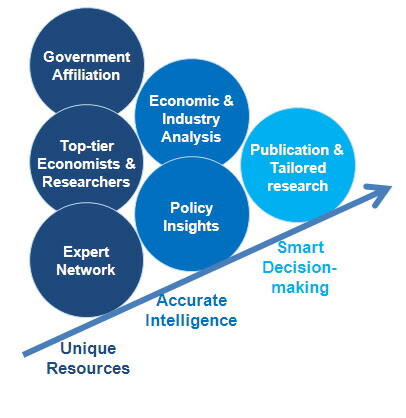 Its Research Base for Industrial Finance (RBIF, 中国社会科学院产业金融研究基地, http://www.rbif.org.cn), a team of top-tier economists and industry experts, works together with us to provide clients with exclusive “Insiders’ Insights” into the economy, industries and policies, to enable you to successfully develop business opportunities in China and overseas. Vice President of the Chinese Academy of Social Sciences (CASS); a former member of the Monetary Policy Committee of People's Bank of China; Chairman, academic committee of Research Base for Industrial Finance (RBIF) . Dr. Li has significant influence on the economic development in China and the globe. He is delegated as nonvoting attendee in regular meeting of State Council (国务院常务会议列席成员). He participates in decision-makings and formulates strategies on important financial and economic issues both national and international. Dr. Li has strong connections with senior government officers from various countries and leaders of financial institutions such as IMF, World Bank, OECD, Asian Development Bank, Central Banks, etc. He is also frequently invited as key note speaker in World Economic Forum and as featured economist by Bloomberg, "Financial Times" and "Wall Street Journal". Dr. Li was a visiting professor in Columbia University and is a professor in top-tier universities as Peking and Tsinghua University. Director General of the Institute of Finance & Banking, CASS; Director of the board, RBIF. Dr. Wang was senior advisor for over 10 government institutions focusing on financial industry reform and development. He also played managing director roles for over 40 corporations handling IPO, Mergers & Acquisitions and organization restructurings. Director General of Institute of Industrial Economics, CASS; Deputy director of the board, RBIF. Dr. Jin was invited by UC Berkley in US as visiting professor and also is a professor in top-tier universities in China. Dr. Jin is president of "China Business Journal" and "China Economist". Director General of RBIF; Secretary General, Research Center of Financial Policy, CASS. Dr. Yang has active connections with senior officers from international financial institutions including Federal Reserve, Congress of United States, Parliament of UK, Reserve Bank of Australia, European Central Bank, etc. Dr. Yang was invited by Australia Academy of Social Science as visiting scholar. Dr. Yang was previously engaged in senior management roles in investment banks, commercial banks and provincial governments. His key research areas include fiscal policy, monetary theory and policy, investment and finance, financial markets and innovation, rural finance, and etc. He holds PhD in economics and postdoctoral degree in management. Dual PhD in economics and finance, was a consultant for the World Bank, Asia Development Bank, a professional member of APEC; a visiting scholar in Columbia University, and a member of the American Economic Association; key research areas: financial markets, and payment and settlement system. PhD in economics from Durham University, was a researcher at the asset management department of China Life, which is one of largest insurance companies in the country; key research areas: international financial markets, and asset management. PhD in economics, a visiting scholar in Australian National University; was a senior government officer at provincial level; key research areas: insurance and social security. PhD in finance, and JD, is a leading contributor for China's asset securitization, and financial laws; key research areas: financial laws, and regulations. PhD in economics, has worked on many research projects funded by People's Bank of China, Ministry of Science and Technology, and other ministries and commissions; key research areas: risk management, assets valuation, and macro-economy. PhD in economics, was a senior advisor for leading funds management company, and security company; a visiting fellow at Hong Kong Monetary Authority (HKMA); key research areas: financial markets, corporate finance, and institutional economics. PhD in finance, was a manager for the research department of a security company; a visiting scholar in Stanford University; key research areas: monetary theory and policy. Master's degree in economics, is also an advisor for Ministry of Housing and Urban-Rural Development; was a head of research for many government funded projects, as well as international projects sponsored by Ford Foundation, Asian Development Bank, etc; key research areas: real estate finance and urban economics. PhD in management; was elected as “the youngest economist in China” in 2009 by cuaa.net for his distinguished research; a visiting scholar in Tilburg University; key research areas: strategic and innovation management. PhD in economics; was a visiting scholar in Asian Institute of International Studies, Netherlands, University of Missouri, Russian Academy of Sciences; key research areas: policies and productivity in service industry. PhD in economics, a prominent economist in China, and a columnist for many major Chinese news papers and magazines, such as China Daily, and Mingpao in Hong Kong; key research areas: real estate, and macro-economy. PhD in economics, has worked in Shenzhen City Commercial Bank, China Merchants Securities Company, and public companies; key research areas: financial policy, and capital markets. PhD in finance, was a chief researcher for banking and financial policy within CASS; was a visiting scholar in Yale University; key research areas: monetary and financial policy, and banking. PhD in economics; was chief editor of World Economy, an acknowledged academic journal in China; key research areas: international finance and macro-economy. PhD in economics, was a economic journalist with Xinhua News Agency; key research areas: financial asset management, and reform of China's capital markets.